عزیز بہنوں اور بھائیوں السلام علیکم! Dear Sisters and Brothers, May peace be with all of you ! Pakistan is a country where despite the prevailing errs of society hope still exists. Parveen Saeed the owner of ‘Khana Ghar’ is an example of such hope in society. A resident of Surjani Town, heard news of a woman who had murdered her two children because she was unable to feed them, and could not bear to watch them slowly starve to death. This incident got Parveen thinking that surely there is enough food in Pakistan that no one need go hungry. With this motive and determination in 2002 Khana Ghar was launched. Khana Ghar is a small dhaba (hut like restaurant) in Khuda Ki Basti located in Karachi. This dhaba provides a full meal (one roti and saalan) to anyone who wants to eat for only 3 rupees. Until recently Parveen had been funding the Khana Ghar herself, and with whatever intermittent donations she could get. But, like they saw good always prevails on the evils, many families and groups have now emerged and help her towards funding the project and ensuring its operations for the welfare of society. 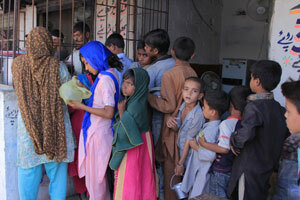 Around 300 people eat at Khana Ghar in Khuda Ki Basti daily, and the cost of the operations comes to about Rs 4,000 a day. 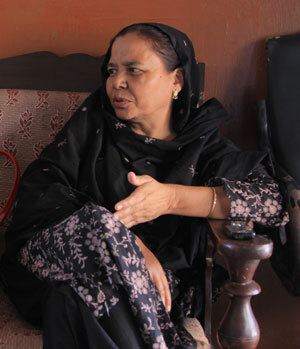 Also Known as ‘the three rupee lady,” Parveen Saeed said “We charge money because we want to discourage the poor from being dependent on free food, they feel better once they realize that they have earned their food.” She provides one time meal to the family in just three rupees just so they could eat comfortably in a respectful manner and the people eating don’t think they have been fed on pity and sympathy. With generous support and donations from August 2008, Khana Ghar grew and established another ‘dhaba’ doubling the number of people being fed and the good deeds being earned. Such people and causes deserve all the recognition and support to survive as they are the real hero’s of society. If every person got up to conquer the evil surely no harm could prevail in Pakistan. Parveen Saeed has a noble cause and is doing a great service to human kind, such stories are the inspiration and eye openers which prove that no matter how much our society may be attacked the good will always rise from within and with time the positivity will beat the negatives. At a time when Pakistan is facing countless problems, there are people who are silently working for the betterment of the motherland. These devoted Pakistanis are working towards accomplishment of their goal to bring Pakistan out of the shadows. These are the people who are striving to change perceptions regarding Pakistan from a terrorism stricken Pakistan to an inspiring Pakistan. Despite of all the pessimism prevailing there are some Pakistanis that are still highly motivated and are contributing towards welfare of the state in their individual capacity. Their spirits are high and they are certain that they can be the positive change agents for the country. When most of the world shows the darker side of Pakistan it forgets to mention heroics like Parveen Saeed. Parveen Saeed is a simple Pakistani who aims to reduce the problems Pakistan is facing today. She is a woman of substance who is serving the country in her best capacity for last 23 years. Parveen Saeed is the face of a brighter Pakistan, positive Pakistan and a Pakistan remains hidden from the world. Love for her country and the spirit to serve descended to Parveen from her parents. Acknowledging that hunger is the root cause of many evils across the globe, Parveen Saeed runs “Khana Ghar” to reduce this problem in Pakistan. “Khana Ghar” serves the poor with healthy food in just 3 rupees. Foundation of Khana Ghar was laid after Parveen Saeed witnessed a dreadful incident in her vicinity when a mother killed her three children because she was unable to feed them for three days. To prove that hunger is not greater than mother’s love, to ensure that rate of such vices fall and to promote the brighter image of Pakistan Parveen Saeed and her team is working day and night. Not only this, but Khana Ghar is also a source of employment and morale booster for many people. People come there, work, earn their living and feed their families. Parveen wants to expand Khana Ghar to all parts of country and desires to see that day soon when no one will sleep hungry. The role that media can play here is highly critical. It is their responsibility to identify such people and share their stories with the world. To inspire people and infuse a spirit of positivism in Pakistanis and show this side of Pakistan to the world. [shashin type=”photo” id=”34″ size=”small” position=”left”] We are citizens of a third-world country where hunger is undoubtedly the worst weapon of mass destruction and is the cause of most evils. It doesn’t seem so to many of us because majority reading this have been blessed and never experienced the harsh atrocities of life. Good news is that we now posses the resources at hand to defeat this cruel enemy at a very reasonable cost and provide food for the hungry but sadly, no one comes forward to end this scourge of poverty. Within the scintillating lights of the city Karachi lies Khuda ki Basti, an area which is the blatant proof of why hunger is a terrifying torture. In the year 2002, a lady named Parveen Saeed set out to bring a change by eliminating the hunger through Khana Ghar .She and her husband are also the founders of Hassan Saeed Welfare Trust which runs two major projects, Khana Ghar and Dawa Ghar (Medical and Maternity home). I have seen her on a couple of TV shows and always had the urge to meet her in person. Last year I was given an assignment to interview a personality and the first named that popped into my mind was of her. Being a resident of Surjani Town herself, she and her husband are both educated and have earned their Masters degree in Journalism from Karachi University. Both of them were absolute philanthropist by heart and wanted to make themselves productive towards the society and destiny soon provided them with the opportunity. Nine years back, Parveen Saeed once heard news of a woman who had murdered her two children because she couldn’t bear to watch them slowly starve to death. That incident was disheartening enough to shock her from the inside and she thought of acting immediately. Hence the idea of Khana Ghar sparked where a full meal for only 3 rupees would be available for the residents of the area. There are hundreds and thousands of philanthropic organizations providing free food but she still charges a cent: why is that? She replied, “….she wants to send a message that when people buy or pay even a little they will NOT misuse food and second: the logic of keeping a very low price will in turn drive people to work enough to get this meal – hence, changing their perspective on life”.But it’s free for the homeless senior citizens, widows and children. Also on religious occasions, they do announce packages in which a two-month reserve of food stock is given as well. Hurdles are part of the process when one decides to do something for the benefit of the society. Similarly, journey to the Khana Ghar wasn’t even close to the word easy. They started off with a door-to-door free food delivery service. Later, cart vendors were hired to deliver food tiffins to the needy in the area. It’s really a tough call when the organization itself is running on funds. 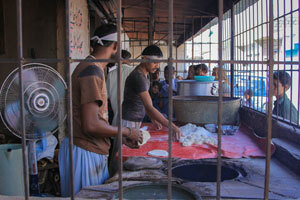 Around 300 people eat at Khana Ghar daily and the cost of it is about Rs. 10,000 a day and with the growing recession rate, it’s really getting hard for them to maintain the budget. The organization does not spend any money on advertisement campaigns due to the same reason. Since 2007, the electronic and print media have been approaching them for documentaries and interviews. In their words, all this media attention has helped them in gathering a good amount of national and international donors but their number is not large. The organization even allow citizens to investigate on their own about Khana Ghar’s credibility before handing over their donations as they don’t want people to remain in any doubt. Parveen Saeed’s dream is to open a branch of Khana Ghar in every under-developed area of Karachi as she believes that if we pledge to eliminate hunger, we can surely reduce the growing crime rate. Have you considered him who calls the judgment a lie? That is the one who treats the orphan with harshness, And does not urge (others) to feed the poor. So woe to the praying ones, Who are unmindful of their prayers, Who do (good) to be seen, And withhold the necessaries of life.